Getting messages my iCloud is full, forcing me into my iCloud screen. My iCloud screen is broken, asks me my password, logs me in for a second, then greys out again. Eventually called support - after I convinced them of all this, which wasn't easy, they asked me to use the manage page under Preferences:Internet, which looks identical but works correctly. Finally managed to get Photos to stop spamming my iCloud account, which I ONLY use to back up my iPhone, having a TB of cloud storage through Google (not set up yet... another story) through this alternate interface. Discover I also have some Pages docs through that interface. 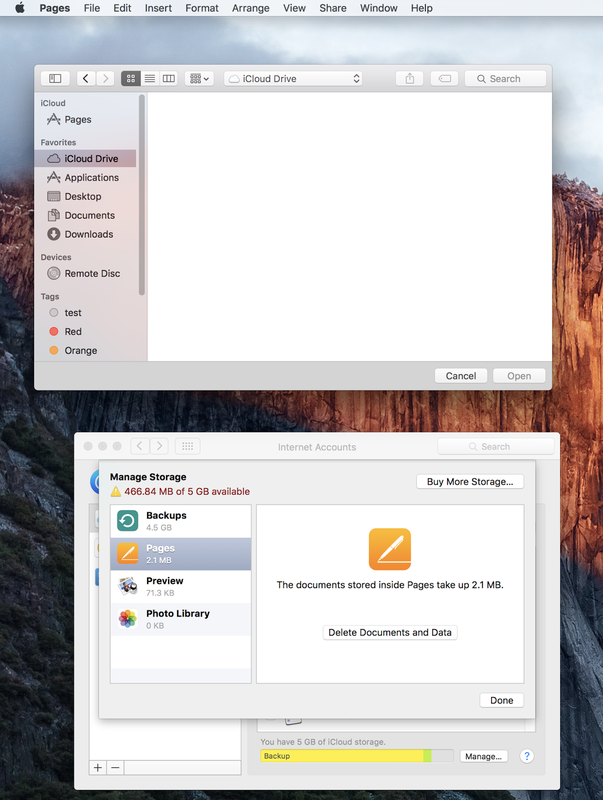 But opening through Pages shows my iCloud "drive" as empty. So I don't have any idea what these Pages files are. (Actually I know what some of them are as I made a poster on my old computer and accidentally stored it on iCloud). Will try it on the computer that made the images. Everything seems to be set up to extract a monthly fee from people who use the camera on their iPhone. And it's broken in at least two places for me. Finally, for some weird reason, the Mail app (which I do not use) says the phone has something for it, and then allows me only to get into the broken iCloud affordance. I really hope that one doesn't come back. I can now dump photos into Photos, and a bit of a Google search shows me that I can delete everything from the phone using Image Capture. So my next backup should be of a reasonable size. Photos has all the features of iPhoto except the basic Photoshop ones I actually use. Halfheartedly searching for how to get my favorite old version of iPhoto running, which wasn't even the most current one. Note that all these problems may have started when Apple insisted I change my iCloud password. I kept old password but uppercased a couple of chars. Conceivable to me that this match/mismatch is triggering bugs. But now I'm totally gunshy about iCloud, just want it to back up my phone and otherwise go away. Experience so far with setting up pretty new mac has been disappointing. My promise to self to set up backups before installing anything so I can revert to a clean system has failed. It just broke by itself... No advice from Apple on fix, just a workaround. It all feels so Microsofty.